Do you know how to stop a dog’s nail from bleeding? 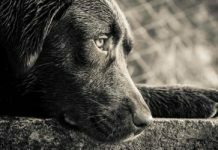 Nothing is worse than seeing your beloved pooch in pain, and if an injury is responsible, the sight of blood may cause you to panic. Of course, you’ll want to do what’s best for your canine companion, and that means providing quick, safe, and adequate treatment as soon as possible. Blood coming from a nail is actually quite common. In this guide, we’ll tell you how to stop a dog’s nail from bleeding. But first, let’s look at why your dog’s nail may be bleeding. 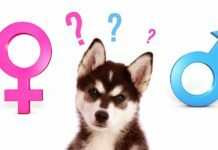 Why Does a Dog’s Nail Bleed? The anatomy of the canine nail is actually quite different from that of a human. Humans have a nail bed, plate, and root that are all firmly secured to each finger and only the overgrown plate can be easily accessed and trimmed. These bones, called unguicular processes, are covered by a fleshy quick and hard nail. The quick of each claw contains small blood vessels and nerves that provide nutrition and sensations so the nails can grow and grip. The outer nail coating is made from a strong material called keratin, which wears away as your canine walks along hard surfaces. The bone, quick, and nail all protrude from the nail bed, making every part of your dog’s claw easily accessible. This is certainly beneficial if your dog’s nails grow a bit too long and you need to trim them. However, as a result, it’s relatively easy to cut through the quick and if you do this, you may see some blood. Bleeding can also occur if the keratin wears away a bit too much and the quick becomes exposed. 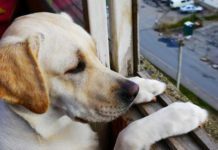 This is a common occurrence if your dog spends a lot of time walking on concrete and a canine with brittle nails may also be prone to breaks and bleeding. So, your dog’s nail is bleeding. What now? Well, you should try to stop the bleeding if you can. Before you start, bear in mind that the quick is extremely sensitive. If you’ve ever cut your own nail too short or accidentally slammed your finger in a drawer, you know injuring this area of the body can produce quite a lot of pain. And the nerves are just as active, maybe even more so, underneath your canine’s nails. Therefore, keeping your dog calm as you stop the bleeding is extremely important. You may need someone to help hold your dog as you work. Also, make sure to use gentle pressure so you don’t cause your canine even more pain. Start by using a clean cotton cloth and place direct pressure on the bleeding nail. Gently press the cloth against the nail for about two minutes. It takes approximately 2-4 minutes for a canine’s blood to clot. So, if the nail is still bleeding, try compressing for another two minutes. Be patient, set a timer, and check for bleeding only once the timer sounds. If you’ve compressed the wound and the bleeding just won’t stop, you could also try some powder to aid coagulation. This will also help to create a scab so the nail does not bleed again once your canine starts walking around. In a pinch, you can use a bit of cornstarch on the nail and studies have shown that potato starch also works quite well to coagulate blood, if you have some handy. Styptic powder works best though—it constricts the blood vessels so clots and scabs can form—if you’re well prepared and have some available. The powder can be purchased at your local pet store and used for minor cuts and scrapes. Place a small amount of starch or styptic powder in the palm of your hand and then dip the bleeding nail into it. If the nail still continues to bleed a small amount after the use of a compress and powder, you could also try closing the wound with a small bit of super glue. The super glue method is not as strange as it may sound. In fact, cyanoacrylate, the active ingredient in super glue, is often used to close surgical wounds. Even oral incisions are closed with glue, so it’s safe for use on your dog. Just make sure that your canine doesn’t ingest any of the glue before it sets. Learning to close the wound is an important step in stopping a dog’s nail from bleeding and to avoid any further injuries. 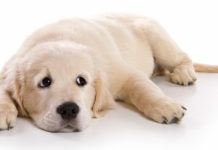 Whereas minor nail bleeding issues can be handled at home, some circumstances require taking your pup to a veterinarian. 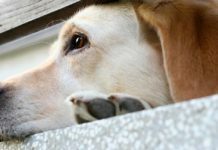 If your canine catches their nail on the sidewalk during a walk or you inadvertently cut the nail at the base, the wound may bleed quite substantially. If this happens, wrap the nail in a cotton cloth, apply pressure, and quickly make arrangements for an emergency visit to the vet. Don’t remove the cloth after 2-4 minutes like you normally would for a minor injury. It’s also a good idea to consult your dog’s vet if you notice a minor cut that won’t stop bleeding. 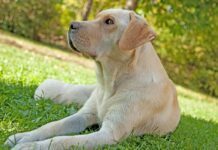 Some canines can have congenital or acquired clotting disorders and unfortunately, you may have no idea there is a problem until your dog is injured. Clotting disorders, like hemophilia, can be serious. The good news is that your canine can be treated with an intravenous transfusion of blood plasma (a frozen blood product) to clot the wound. Afterward, tests can be performed on your pooch to find out which clotting factor your canine is missing. Then your dog can receive the treatment they need to avoid any bleeding issues in the future. If you notice your dog’s nail bleeding after a walk, there’s a good chance your dog has brittle nails. Try walking your dog on soft ground instead of sidewalks and roads. Also, speak to your dog’s vets about possible nutritional deficiencies that could be causing brittle nails. Veterinarians can test for vitamin deficiencies and investigate any gastrointestinal issues that may be causing poor absorption of nutrients. If your pup does have a deficiency, the vet can recommend supplements or specific high-quality dog foods. In addition, some types of fungal, yeast, and immune system disorders can cause brittle nails. Fungal infections are especially common. But thankfully, the problem is not a serious one. Both antifungal medication and fish oil have been found to effectively treat the issue. Or you could ask your dog’s vet to recommend a medication or supplement that is best. Once you’ve learned how to stop a dog’s nail from bleeding, you should keep an eye on the nail for a few days to make sure it doesn’t start bleeding again. 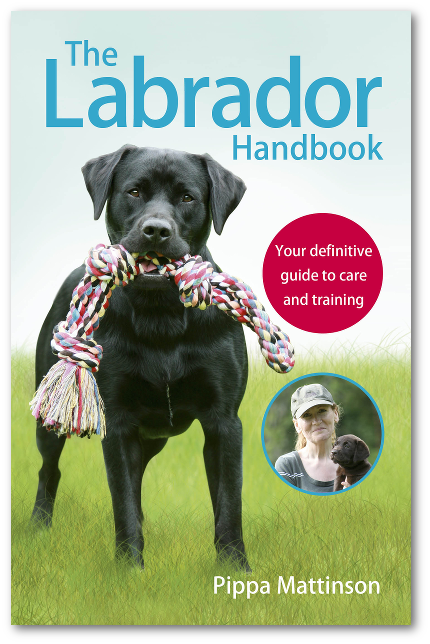 Also, try to keep your dog calm and quiet for at least an hour or two after the initial incident to help with coagulation and allow the scab to solidify. You’ll certainly want to avoid any future nail cutting incidents. 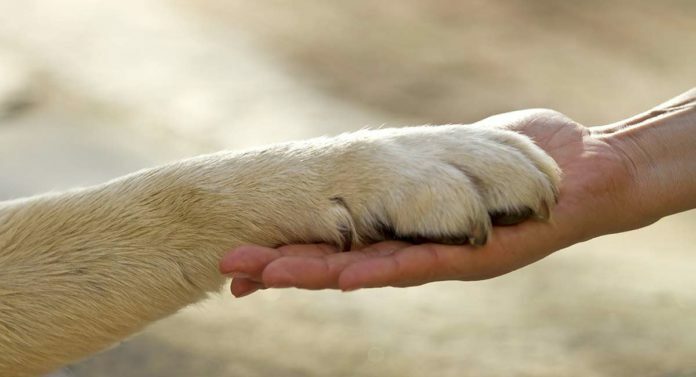 You can still cut your dog’s nails, but care should always be taken when doing so. Use the right type of clippers made specifically for cutting dog nails and make sure they are the correct size for your canine. Also, make sure to use the correct method to avoid nail bleeding. Most importantly, identify the quick first, so you can safely cut above it. The quick will look dark since it contains a vast blood supply, so simply cut a few millimeters above to make sure you don’t crush the nail. Sharpening your trimmers or using a brand new pair of clippers can reduce crushing and breakages. If you can’t see the quick—perhaps your canine has dark nails—then only cut a small sliver from each claw. Also, only trim when required—you’ll hear the telltale click-clack of your dog’s long nails hitting the floor when it’s time. If you see your dog’s nail bleeding, don’t worry! A bleeding nail is a common issue among canines. Scraped nails that break during walks and nails that are cut too short are likely to bleed. Thankfully, bleeding caused by cutting your dog’s nail too short can be stopped fairly easily in most cases by applying a little pressure or with the help of some styptic powder. If your dog’s nail won’t stop bleeding and you feel it’s an emergency situation or if you think that something else may be going on, be sure to consult your dog’s vet. 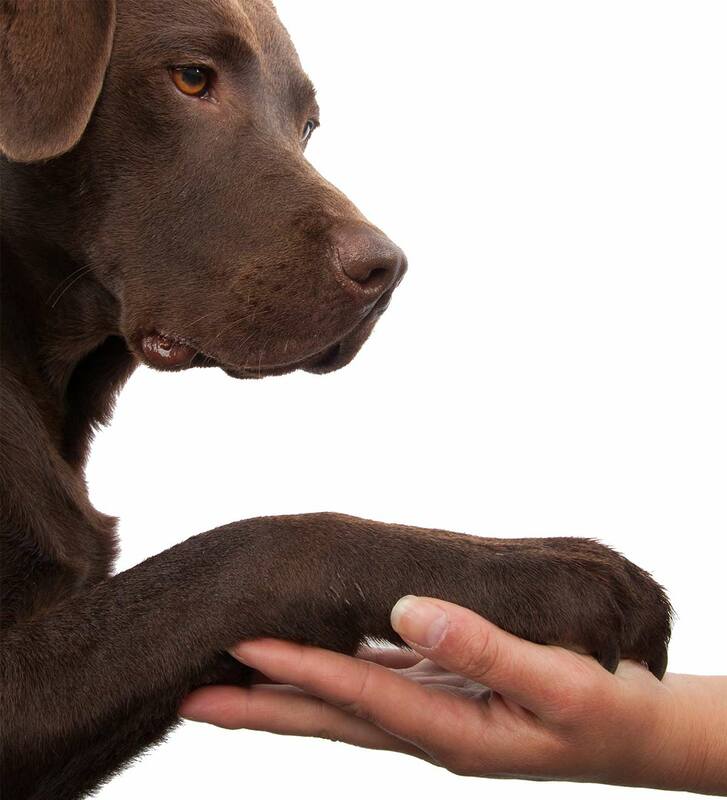 A vet can treat your dog and test for other ailments that may be causing bleeding or brittle nail issues. Do you know some other ways to stop a dog’s nail from bleeding? Have you ever experienced any specific problems with your dog’s nails? Let us know in the comments below. Jamnicki M et al. 1998. The effect of potato starch derived and corn starch derived hydroxyethyl starch on in vitro blood coagulation. Anaesthesia. Eriksson L. 1976. Cyanoacrylate for closure of wounds in the oral mucosa in dogs. Odontologisk revy. Walton JE AS, Hale AS, and Brooks MB. 2014. Coagulation Factor and Hemostatic Protein Content of Canine Plasma after Storage of Whole Blood at Ambient Temperature. Journal of Veterinary Internal Medicine. Knudsen T, Kjelgaard-Hansen M, and Tranholm M. 2011. Canine specific ELISA for coagulation factor VII. The Veterinary Journal. Ziener ML and Nødtvedt A. 2014. A treatment study of canine symmetrical onychomadesis (symmetrical lupoid onychodystrophy) comparing fish oil and cyclosporine supplementation in addition to a diet rich in omega-3 fatty acids. Acta Veterinaria Scandinavica. Next articleNeem Oil For Dogs – What Does It Really Do?